7 - 16cm; A slender, somewhat fragile-looking salamander with a smooth, shiny dorsum and flanks consisting of 11 to 13 distinct costal grooves. In healthy individuals the tail is well-developed and fleshy (longer than body in males, shorter in females) with a distinct constriction near the base (the point at which the tail can be amputated as a defensive mechanism). The head is rounded with huge, dark soulful-looking eyes. Colour patterns are so variable across some of the subspecies that they may soon, once again, be designated distinct species. All species possess a pale white or yellow belly. The Ensatina is distributed along the Pacific Coast of North America, from central California, Oregon and Washington to southern British Colombia. Extensive and relict populations exist in the Sierra Nevada Mountains. Its favourite habitats are the cool, humid maple, redwood, oak, cedar and pine forests along coastal regions, in valleys and up to an elevation of 12,000 feet. It is regularly found on the verges of slow flowing streams and rivers and loves skulking about in damp leaves and grasses in search of invertebrates. Extremely secretive in disposition, it possesses several defensive mechanisms. The tail is easily amputated when grasped and as the severed muscles retract this causes the tail to wriggle, allowing the salamander an escape. This species is also known to secrete milky alkaline toxins from glands in the tail which are extremely distasteful and irritable to most predators. The nominate form and the most familiar. A brick-red or light brown, slender dorsum with lighter (sometimes orange) limbs. Range - coastal southern California from the Del Monte Forest in the Monterey peninsular to northwest Baja. Black or dark brown dorsum patterned in small and irregular pale yellow or yellow-green blotches. A large blotch exist behind each eye. Range - Rather limited, scattered distribution in the foothills of Kern County, California. I found this species in small numbers near Mount Pinos. Very similar in appearance to E.e.croceator, however more stockily built with much larger blotches, the colours of which range from pale yellow to orange. One of the largest and most beautiful Ensatina forms. Range - East of San Diego in the vicinity of alpine habitat. I found this species in an area close to Mount Palomar under large fallen pine trunks. It was extremely cold (sub-zero in some places) and snowfall was evident. Where its range overlaps with E.e.croceator or E.e.eschscholtzi, an integrade may occur. Very similar to E.e.eschscholtzi although dorsal coloration tends to be a lighter brown or even fawn with varying black flecks and belly peppered with dark speckles. Rather more lizard-like in appearance compared to other ensatina's. Range - The most widespread species occurring from south-western British Columbia down to the north-central reaches of California. Where its range overlaps with the Sierra Nevada Ensatina E.e.platensis (mainly in Shasta County, California) an attractive brown with speckled orange integrade occurs. One of the most attractive ensatinas with a dark brown to black dorsum revealing a conspicuous network of whitish yellow to orange striations. Range - Coastal southern Oregon and northern California. Possibly the most beautiful ensatina. The dorsum background colour is dark brown or black and covered with conspicuous orange or sometimes red blotches. The head is large and the body laterally compressed. The tail is very fleshy and stubby. Range - Small pockets throughout the Sierra Nevada mountains and is particularly abundant in the humid redwood groves of the Sequoia and King's Canyon National Parks. Almost identical to the Monterey ensatina apart from two distinguishing features; as its name suggests its upper eye possesses a yellow eye patch and the dorsum can vary from brown to a orange brown. Range - widespread throughout the San Francisco Bay area Down to the western slopes of the Sierra Nevada mountains. It is particularly abundant throughout the state parks of the region and I found hundreds of these creatures skulking about in between leaves and loose bark, especially near stream and rivers. Ensatina demand a spacious, cool and damp terrarium with plenty of dark hiding places. They will not tolerate dry conditions. Maintain no more than six individuals within a 10 gallon aquarium because males of this genus are territorial to a certain extent. The terrarium should be divided into three parts; In one corner there should be small, shallow water pan, no more than 5cm deep. This pan serves two purposes; one it allows the salamanders to bath should the rest of the terrarium dry out, and two it promotes higher humidity. Surround the water pan with lots of smooth rocks and pebbles and pad out the gaps loosely with sphagnum moss. This provides the salamanders with ideal humid resting places. The remainder of the vivarium should consist of about 5cm of a chipped forest bark and deciduous leaf loose mixture. I also like to encourage some wild grasses and ivy (Hedera) to grow (maintaining them in their pots which are concealed by the mixture). Finish off this by placing several pieces of cork bark, bogwood or swamp wood on top of the mixture, providing these secretive salamanders with more hiding places. Such a setup must be kept moist and also cleaned out every 7 - 10 days to prevent too much fungal and/or bacterial growth. There is certainly no requirement for UVB lighting (unless live plants are maintained in the terrarium) because ensatina are primarily nocturnal or crepuscular. Locating the terrarium in a well lit place (but not in direct sunlight) will provide them with the photoperiods necessary to promote breeding. Heating is the most important and difficult aspect of ensatina care. Unless a temperature below 70�F. can be constantly maintained then there really is no point attempting to keep them as they will simply die. Heat stress is a well documented fatality in these and many other plethodontid salamanders. The optimum temperature range is in fact 48 - 64�F. (preferably to 58�F. only for E.e.platensis and E.e.oregonensis. Temperature governs reproductive, feeding and hibernation behaviour. In the wild these salamanders are able to move deep underground to escape heat. In captivity they do have such opportunities. In some areas it may be necessary to install some sort of air cooling/conditioning device, or I have personally utilized an old refrigerator, converted into a glass fronted cool terrarium. Humidity is also important. As ensatina are plethodontid or lungless salamanders, the exchange of oxygen and waste gases through the skin demands a moist environment. Mist the terrarium three or four times daily, using a slightly acidic water (clean rainwater which is free from pesticides/herbicides is ideal). DO NOT close off ventilation points to increase humidity. This will result in stale air and fungal/bacterial explosions which will prove far more harmful. Always ensure there is excellent ventilation. The water pan contents must be changed on a daily to two day basis. Misting of the cage should take place just before lights are switched on/near dawn and just before dusk/lights are switched off. Food for these salamanders consists mainly of insects, preferably centipedes, spiders and small crickets. They will also take small earthworms, waxworm, freshly sloughed mealworm and even their own young. Crickets should be gut-loaded with carrots, oranges and other nutrients. Food can be dusted every other sitting with a vitamin supplement such as Rep-Cal. Ensatina hunt mainly at night so introduce a sufficient number of these food items during dusk. Ensatina MUST be hibernated from December to February at temperatures of around 40�F.. I hibernate my specimens in a refrigerator but ensure that the container is given air at least twice a day. Only those healthiest ensatina which possess sufficient body fats should be hibernated. Yearlings and two yearlings should be cooled to a minimum of 50�F. 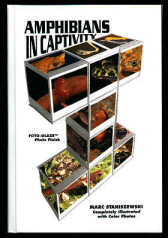 In the wild Ensatina also aestivate but this is nether essential or recommended for indoor captives. Breeding can be quite difficult. I had greatest success by maintaining my adults in an outdoor unheated greenhouse in central England. Correct hibernation, temperature and humidity regimes are essential in reproduction. Courtship takes place in September or October, usually after heavy downfalls, which can be mirrored by increasing the misting duration until the terrarium is sodden. Males are distinguished by their longer tail, more slender build and presence of nasolabial grooves running from the nostrils to the upper lip. Eggs are laid in moist depressions in moss or leaf litter. Adult females (and sometimes males) are one of the few salamanders to guard and moisten the 8 - 14 large yellow or whitish eggs that are deposited. It is thought that these secretions contain anti-bacterial and fungal chemicals. In captivity such parental behaviour does not always occur, especially if the salamanders are constantly disturbed. It is therefore wise to check on the eggs only occasionally. Larval development takes place entirely within the gelatinous egg shell. Miniature replicas of the parents hatch out after 55 - 80 days and must be separated from the adults who are likely to eat them. Sexual maturity is achieved after 2 to 3 years. For the first time in 1998 I was able to breed the large-blotched ensatina. My female deposited 12 large (8mm diameter) eggs and then spent 12 weeks brooding over them. Occasionally she would leave them in search of food during which another female would brood the eggs. Near hatching I experimented by removing a single egg. During hatching the female ate 2 young. I was able to retrieve the rest. The removed egg collapsed and did not hatch proving that female care is absoluetly essential through the entire brooding period. Picture below show the eggs and a hatchling. In captivity, these salamanders are known to regularly live for at least 12 years. I have had a pair of Sierra Nevada ensatina living in an unheated greenhouse for nearly 10 years and they were adults when I acquired them. Handling of ensatina must be kept to a minimum. The tail can be easily amputated at the slightest touch, and a regrown tail is rather stumpy, discolored and distinctly less attractive. Please note that all Aneides species and other amphibians are strictly protected within U.S. State and National Parks and should not be collected unless you have special authorisation to do so. Information gathered from the following books/persons was used in the generation of this page. Click on the address provided below if you wish to submit comments on this page by E-Mail.